Creatures of the Reef is finished. 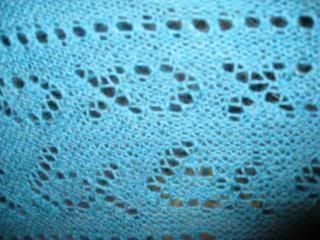 I had my groovy blocking wires for the top (cleaning out the garage: it's a good thing). This is the first time I’ve actually used them, and overall I really did like them…although I wish they were longer. I used both the thin wires I had in the kit (I don’t remember when or where I got it, actually), and they still weren’t long enough for the entire top. This has been a really fun project. The patterns are interesting, but not so hard they make you cry. The designer has even made things extra-easy for you by suggesting you put stitch markers at the beginnings of each pattern repeat. It’s like the ‘to save time, check gauge’ thing – sometimes you don’t want to “waste” time doing the gauge swatch, and sometimes I didn’t want to “waste” time placing and otherwise futzing around with markers, but they were in fact huge time-savers in the end. Blocking has done wonders for the clarity of the patterns. This was just plain fun to do, and a stitch I’d never done before. 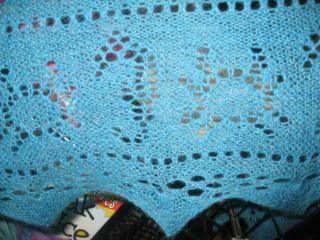 On the odd row, you did a yarn-over thing: yo, k1, yo twice, k1, yo THREE times, k1, yo twice again, k1, yo, k1. Then on the even row, you knit those k1 and just dropped the yarn-overs. It was just fun, you know? Whip-over! Knit one. Whip-over, whip-over! Knit one. OK. So. Yeah. I’m easily entertained. 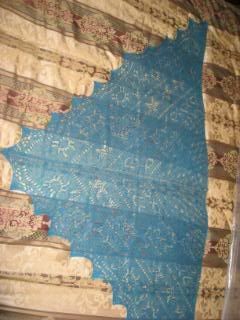 But I’m very pleased with the shawl. 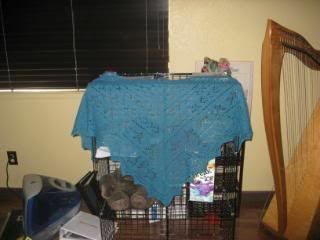 It was fun to knit, the instructions were easy to follow, it was a relatively fast knit (time available for knitting was scarce, otherwise I wouldn’t be surprised if I could actually have done this shawl in a much shorter amount of time), and it turned out beautifully. I’m also very happy with the Knit Picks yarn. 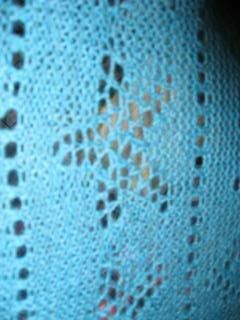 This shawl took two hanks of Knit Picks Shadow, in Snorkel. At $2.99 a hank, YES THAT’S RIGHT, this cost me $5.98 for the yarn. I paid more for the pattern than the yarn…how often do we get to say that?! The dye was nice and even, the yarn itself is of perfectly decent quality, and the end result is light, airy and warm-like-wool. 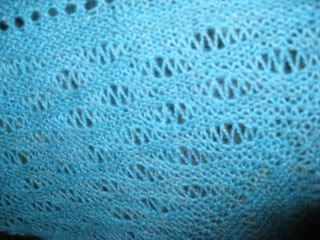 I’ve still got a fair amount left of the second hank, too – enough for a small lacy scarf, possibly. Thank you for the review of both the yarn and the pattern. You're tempting me! 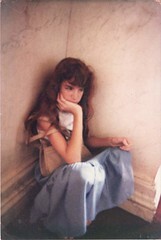 And, of course, I have nothing in my queue (wink! wink!). What?!? You made that gorgeous thing for less than $6? Now I'm even more impressed. It really turned out beautifully. Harps are no help when you need them, are they? It looks so very lovely! I would be crying, though. Even with the stitch markers. Beautiful. I am still (constantly) amazed at how much knitting you whip out, with everything else you have to do. Of course I'm sure that having an attention span longer than that of a gnat is probably a great help!